Greetings Wargamers and Hobbyists, and welcome once again. 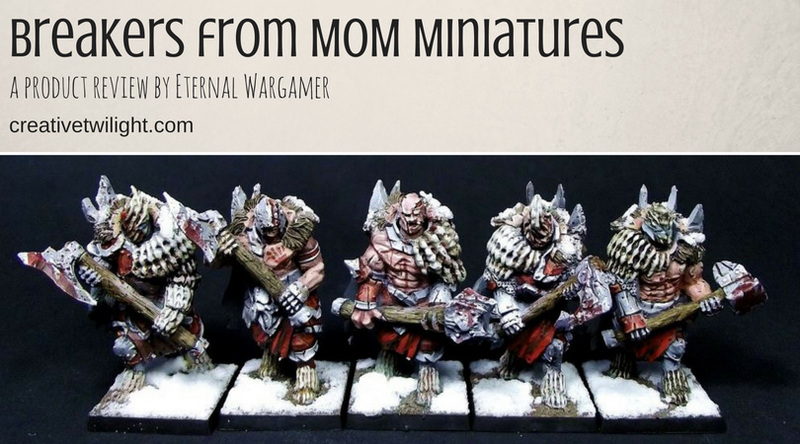 This time around, I bring you a review of a set of models from MOM Miniatures; The Breakers! 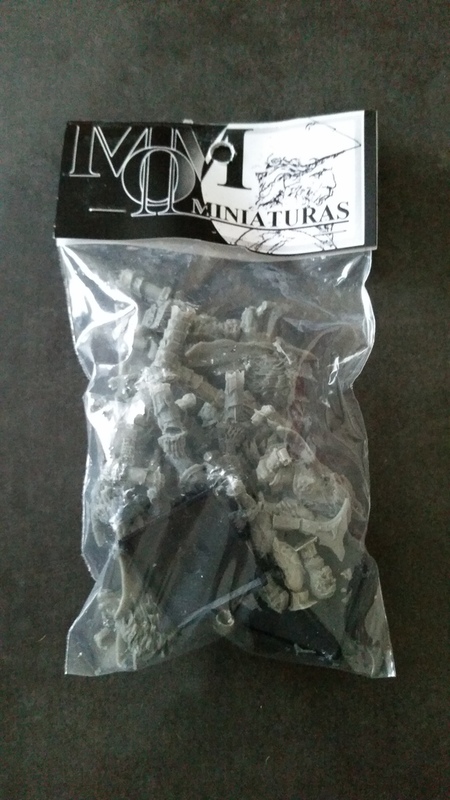 I found these miniatures while searching for something to use as ‘Fallen’ for my Varangur army for Kings of War. There happened to be a post on Facebook advertising the MOM Miniatures 25% discount sale for Black Friday. Kings of War being the game that it is, Varangur players have used all sorts of models as Fallen. Gamers have selected various Games Workshop Chaos miniatures such as Chosen and Spawn, Chaos Warriors, and Blood Bound Warriors. Models from third party suppliers have also been used, including some from Reaper, and others. After getting views from other players, I concluded that there were two options that suited my tastes. Either Chaos Chosen from Games Workshop, or the Breakers from MOM Miniatures. As it transpired, I liked both sets of models equally. The plastic Chosen offered an easier and more reliable material to work with, and assuredly lots of spare components. The Breakers however were a third of the cost of the GW offering, and I had also decided to make a further purchase from MOM Miniatures. I had already placed an order for six Runic Guardians for use as Earth Elementals for my Dwarfs. It was a simple enough choice to add the five Breakers to my order. I also feel that the Breakers have a more ancient look about them than the rest of my Varangur. Most of the models in my collection are from the ‘first Storm of Chaos’ era of Games Workshop Chaos models. As the description of the Varangur indicates that Fallen are amongst the first of the followers of Korgaan, warriors from an earlier time, an older style of apparel would suit them. The Breakers are the first of MOM Miniatures’ products that I have worked on. From my experience with resin, this seems to me to be good quality, harder resin than some miniatures I have had. It is still soft enough however to cut into without too much effort. There were relatively few mold lines to remove, however there was a fair bit of flashing to cut and file away. Overall this didn’t prove to be too difficult. There was a slight miscast on one of the axe heads, but not so much that I couldn’t salvage it. Usefully, although there are five Breakers in the pack, there are seven warrior heads to choose from, and six weapon heads. I wouldn’t need to use the miscast axe head if I didn’t want to. One of the axe hafts ends had snapped off, seemingly in transit from Spain to the UK, but as clean snap this would glue back on without any issues. Construction of these miniatures is easy enough. Body, arms and legs are all one piece, with only the warrior heads and weapon heads separate. 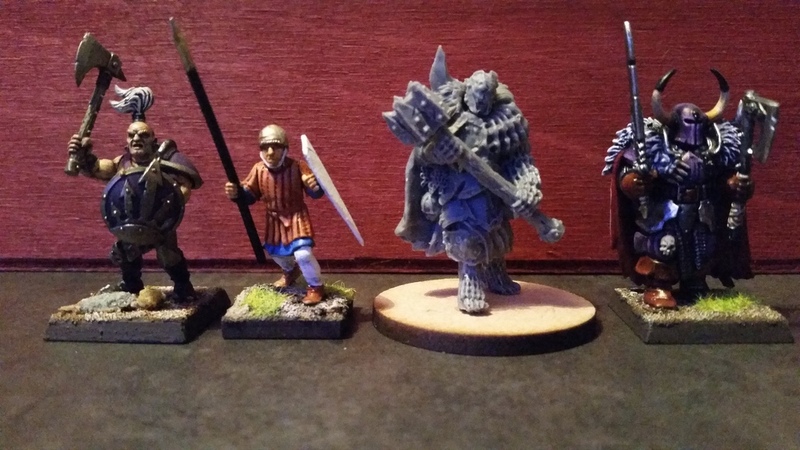 I do like the detailing on these miniatures, and there is a fair bit of that on them. The bone decoration in various places, such as the feet, looks a little strange, but you can see from the side that this is mounted over the boots the warriors wear. The Breakers’ heads and flesh are cut in many places. The visages of the Breakers are either gruesome, masked or seemingly aflame or mutated. This will help to mark them out from less favoured warriors. Although I purchased them for use as Varangur Fallen, I will also be able to use them as Chaos Chosen. They are certainly large enough to make them stand out in a crowd. Once the components had all be cleaned up, flashing removed, and excess resin cut carefully away, it was time to wash them. To stop the models from sticking to the insides of the molds, manufacturers use a release agent. The agent also inhibits paint from adhering to the surface of the miniatures. 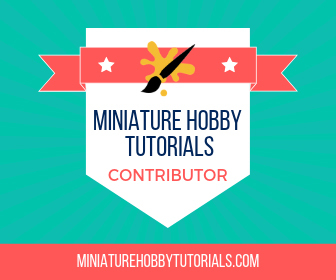 Resin models should be washed in soapy water and brushed lightly with an old toothbrush. Once you have done this, you can go ahead and assemble the miniatures. Hmm. I find basing a bit of a funny one. I’m a multi-gamer to my core, which means I like to be able to use my miniatures in as many different game systems as possible. I’ll use the Breakers in at least two games: Kings of War and Age of Sigmar. I needed to decide whether to mount these miniatures on the 25mm square bases (to match most of the rest of the army), or on rounds to make them fit better with my Age of Sigmar collection. Because I’m slowly converting all my Fantasy miniatures to round bases, and the Fallen fight in a ‘skirmish’ formation, I decided to go with 40mm rounds. The base size for them in KoW is 40mm square anyway, but as Kings of War units are based around the unit footprint rather than the individual model bases, it is no detriment to playing Kings of War with them. As you can see from the photo to show comparative size, the Breakers are fairly large. This is fine by me, as the Varangur Fallen are meant to take up a lot of space on their unit base anyway. When used as Chaos Chosen in Age of Sigmar, they are sufficiently larger than the standard Chaos Warriors to fit the role also. 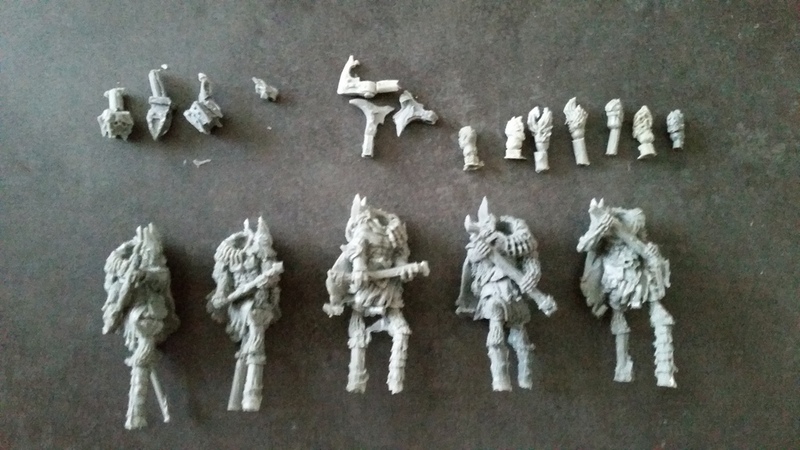 The models pictured with the Breaker are; Chaos Marauder from Games Workshop, Foot Sergeant from Fire Forge, and Chaos Warrior from Games Workshop. What I was looking for with these guys was a set of models that could fill that ‘elite few’ role in my collection. As far as I am concerned, that’s just what I got. The fact that there are only a limited number of poses with this set is not a concern, as I only have a few of them. This issue is further mitigated by the fact that all of the warrior heads and weapon heads are interchangeable. The sculpts may have a limited number of poses, but you could still build many subtly different models with the parts provided. I am happy that, for what I wanted, I made the correct choice. The sculpts themselves are awesome, lots of details, and a unique style that doesn’t clash with the rest of my collection. The cost of these is the clincher, if one were needed. Five very nice models to add to my army, for less than £8? Yes please. I would however recommend saving up your MOM purchases into a batch, or get together with friends. The postage from Spain is not inexpensive, so worth clubbing together to bulk out your order. I am sure I will be looking at more of MOM Miniatures products in the future. A very affordable option with nice casting quality. Well worth it. I could definitely see using those models for something. The quality looks good and I like the style of them. Shipping to the US would be pretty insane I’m guessing though. I expect it wouldn’t be cheap – it was $10 to the UK. But worth it for a sizable order. They have a lot of nice minis. Always nice to see what other manufacturers are out there. So cheers for that. Thanks Rory. I agree, there are so many other manufacturers out there apart from the really well known ones that it’s a joy to find one we didn’t know so much about, and with miniatures that are that bit different. Soon I expect to be writing another review on a popular set from Flag and Drum – their Dark Alliance War Trolls! MOM miniaturas are BBB (Bueno, bonito y barato), thai is good, nice and cheap. I have some of the for my empire army ando for my elf army and they are pretty nice models. They do have some very nice models. I got 6 of their Runic Guardians for my Kings of War Dwarf army.